I love a hot breakfast and I can’t count the number of times where I have decided to ditch the yogurt I had planned for breakfast and a hit a drive through on the way to work for a hot meal. This habit, although kept my tastebuds happy, was not so good for my waist. So in an effort to curb this, I have been prepping healthy, warm meals the night before that I can box and heat up at work. I’m happy cause it’s a tasty warm meal and my waist is happy cause its protein packed goodness. 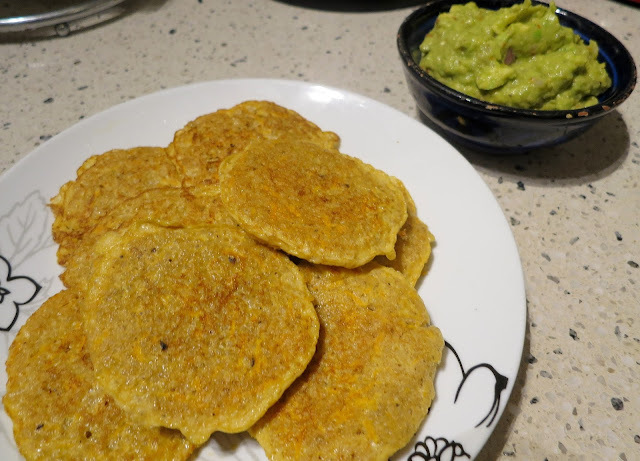 One of the meals I have prepared are these fritters which I serve with homemade guacamole (healthy fats!). The other great thing about this healthy breakfast option is that it is low GI and keeps me fuller for longer (and stops the 10am snacking). So many wins! 4. Heat a frying pan (grease if non stick), and add three spaced out spoonfulls. Allow to cook for a few minutes or until the edges brown then flip over and cook the other side (like pancakes!). Repeat the process until mixture is finished. These fritters are great for any meal. I love esp. the add of carrots in them. Ooh these look great, what a great recipe for the kids! These look healthy and delicious - great for brekky!